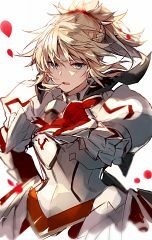 494 anime images in gallery. 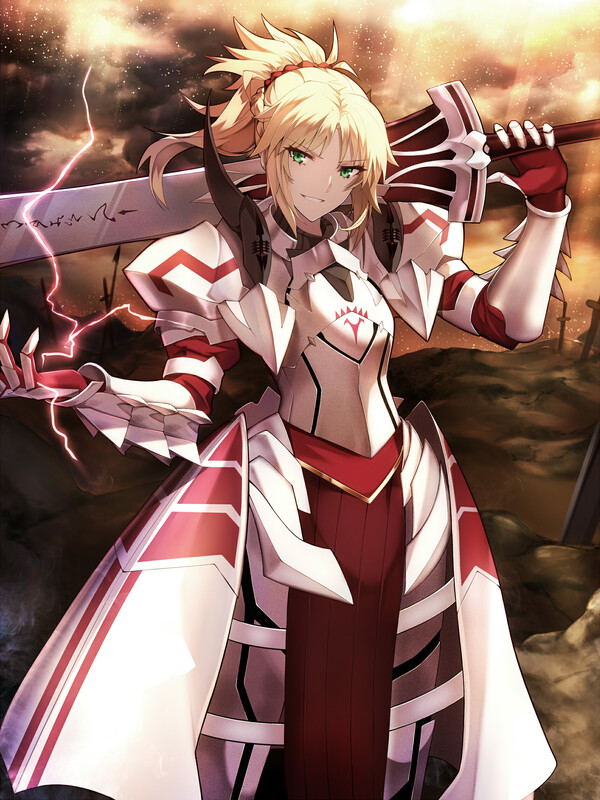 Tagged under Fate/stay night, Fate/Apocrypha, Sawashiro Miyuki and Red (Meta). 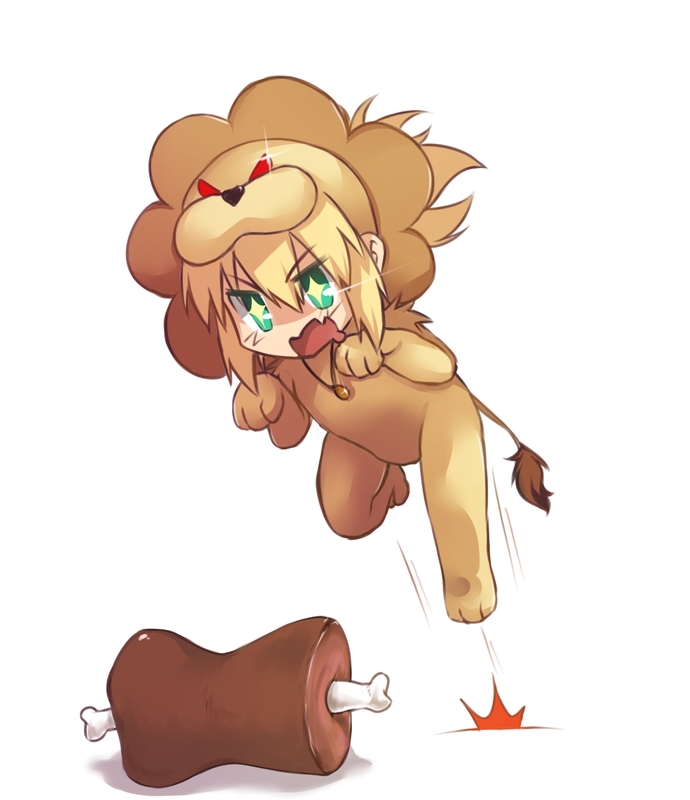 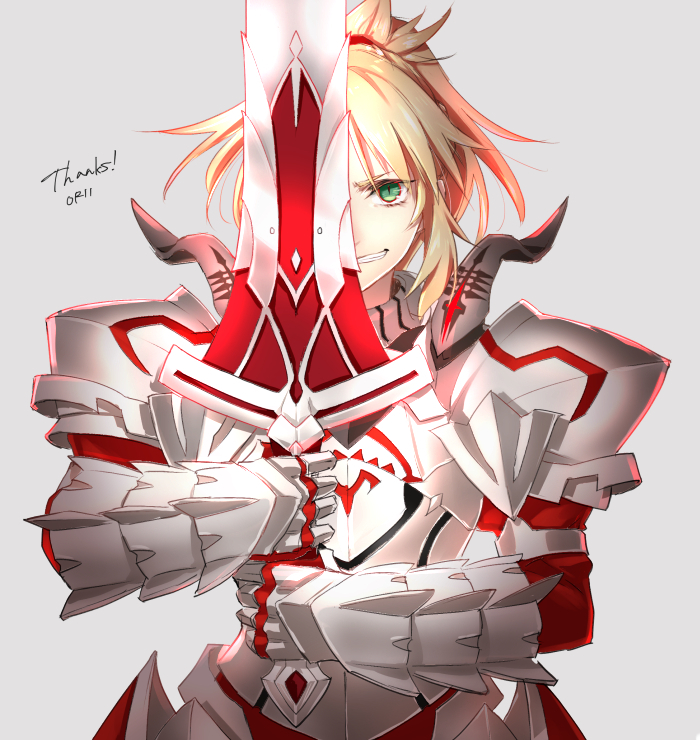 Mordred is a Knights of the Round Table. 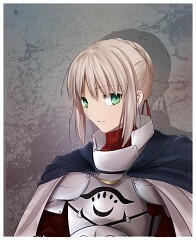 He is the son of King Arthur, created by magic. 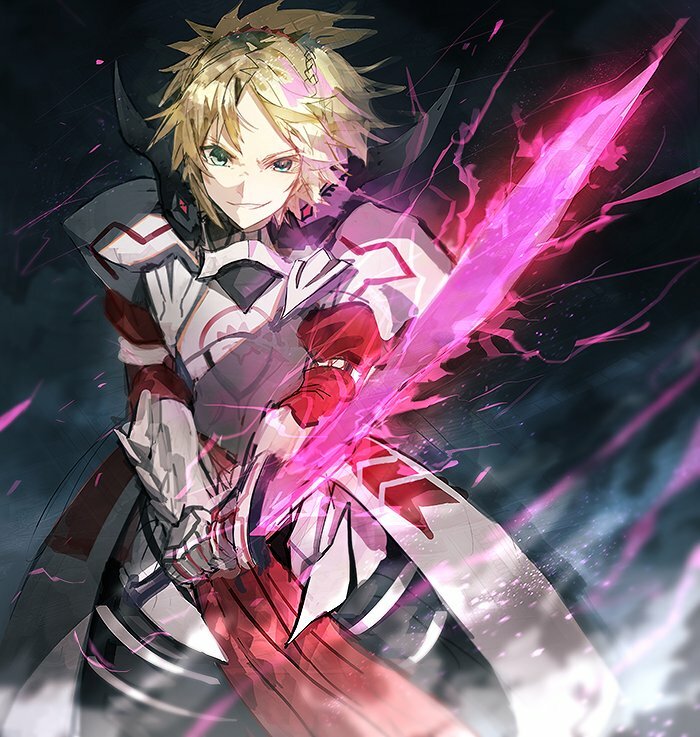 Due to his father's rejection of him, he eventually became the leader of the rebellion that resulted in the destruction of Arthur's kingdom and their mutual demise at the Battle of Camlann. Mordred's true appearance is known to very few. 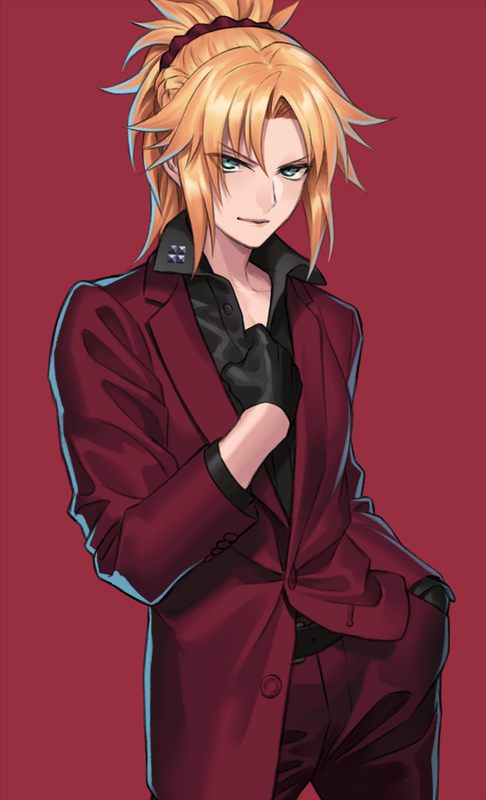 He generally wears a red overcoat lined with gold at its edges. Over this, he wears heavy gray armor consisting of gauntlets, chestplate, pauldrons, greaves and helment. 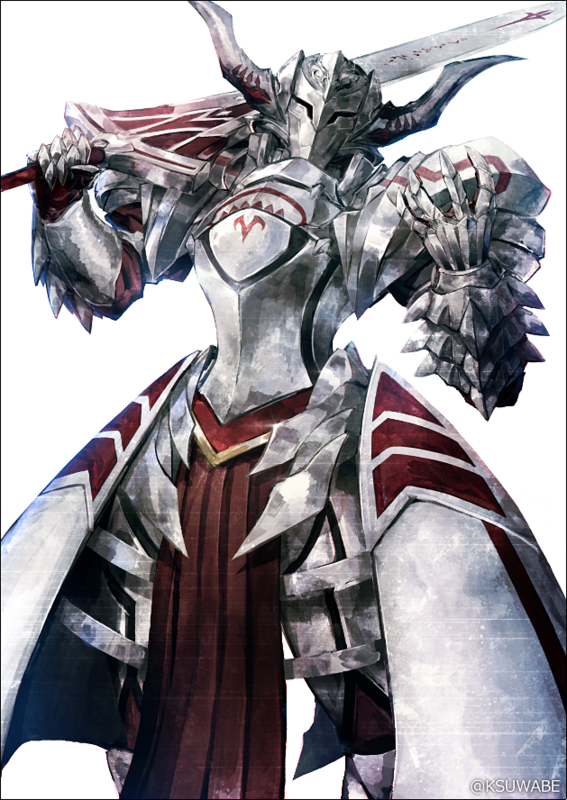 Mordred's horned helmet conceals his face out of necessity. 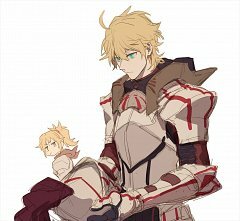 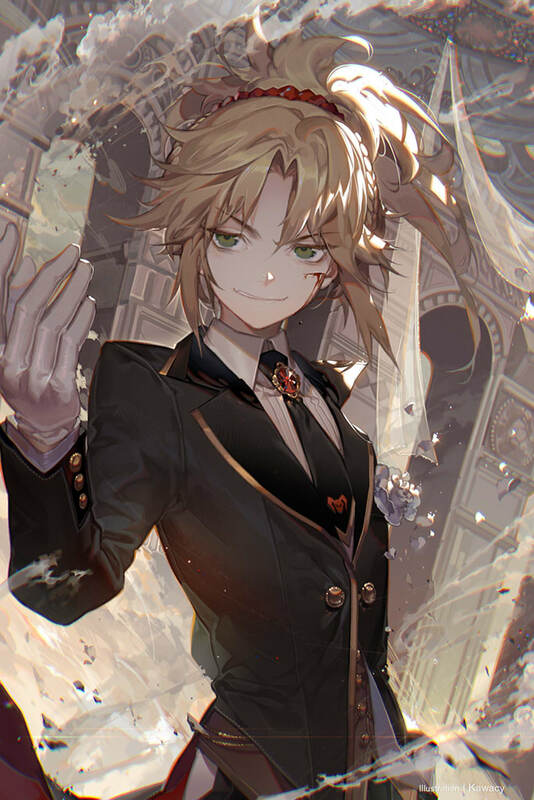 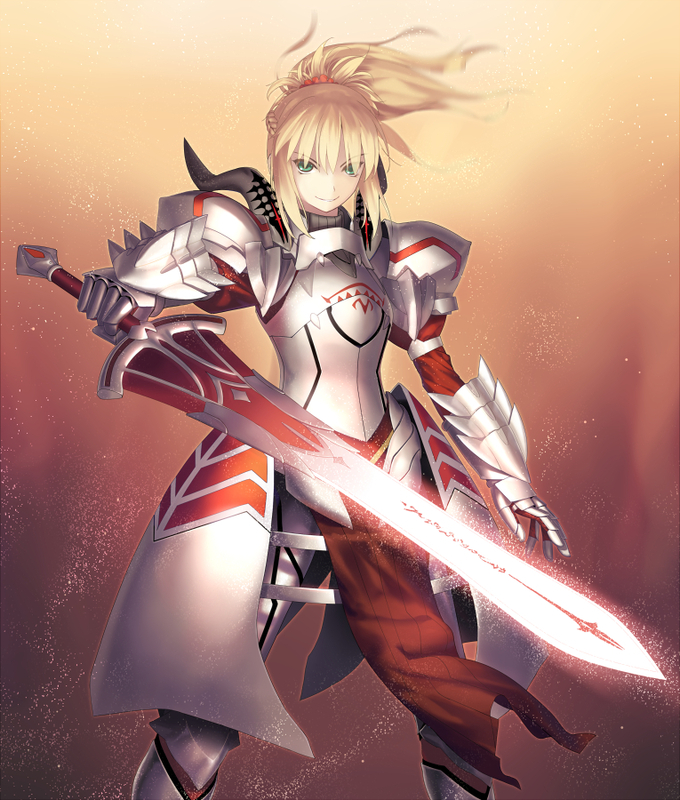 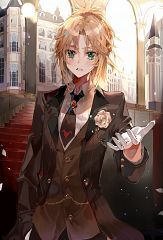 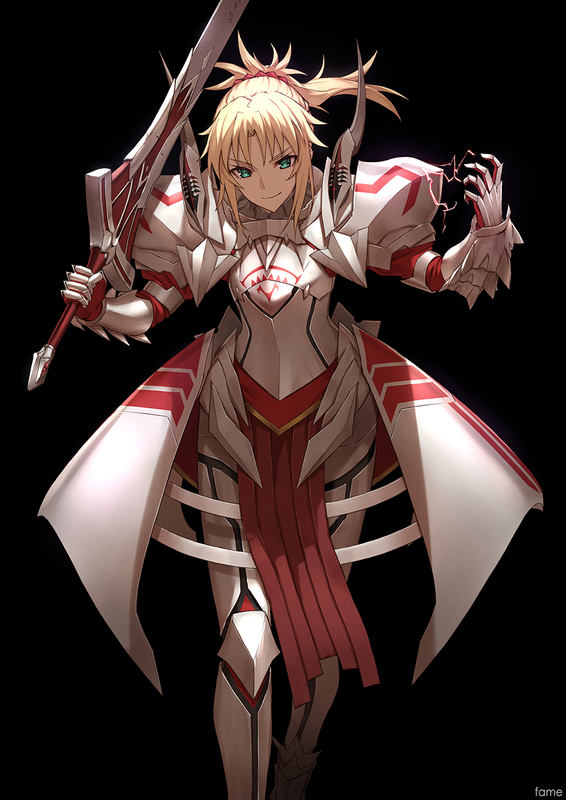 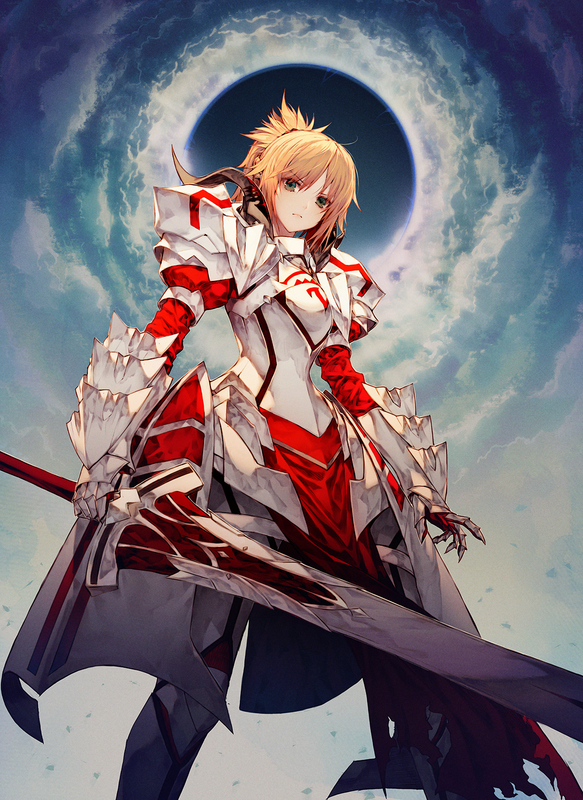 Underneath the armor, Mordred is a beautiful, lithe young man with long blonde hair and green eyes who looks exactly like Arturia Pendragon. 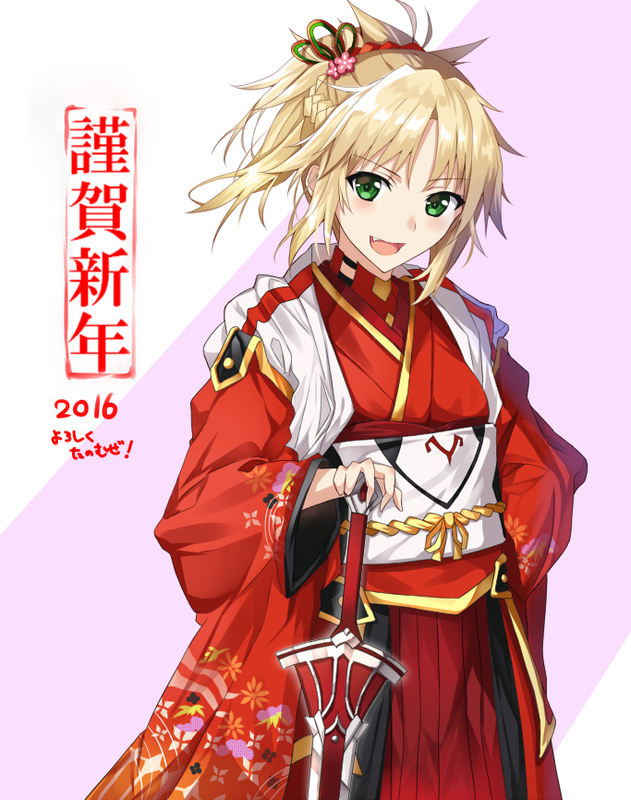 Red Saber (Saber of "Red", "赤"のセイバー, ?) 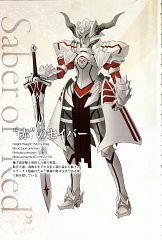 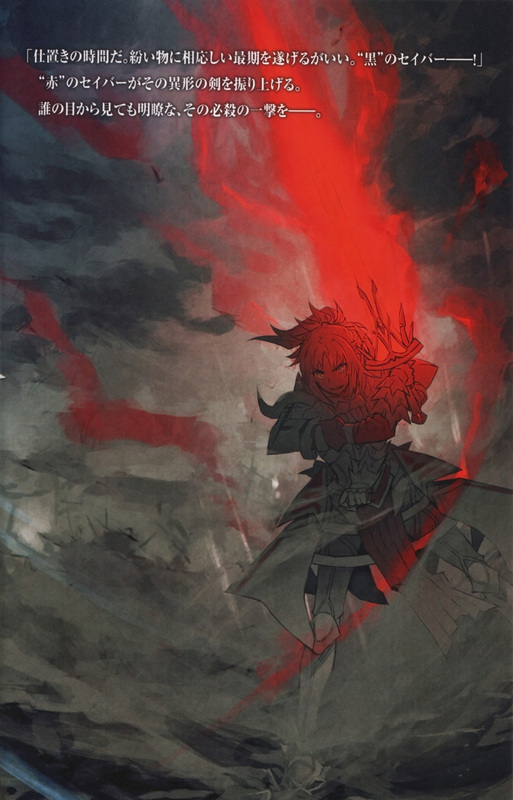 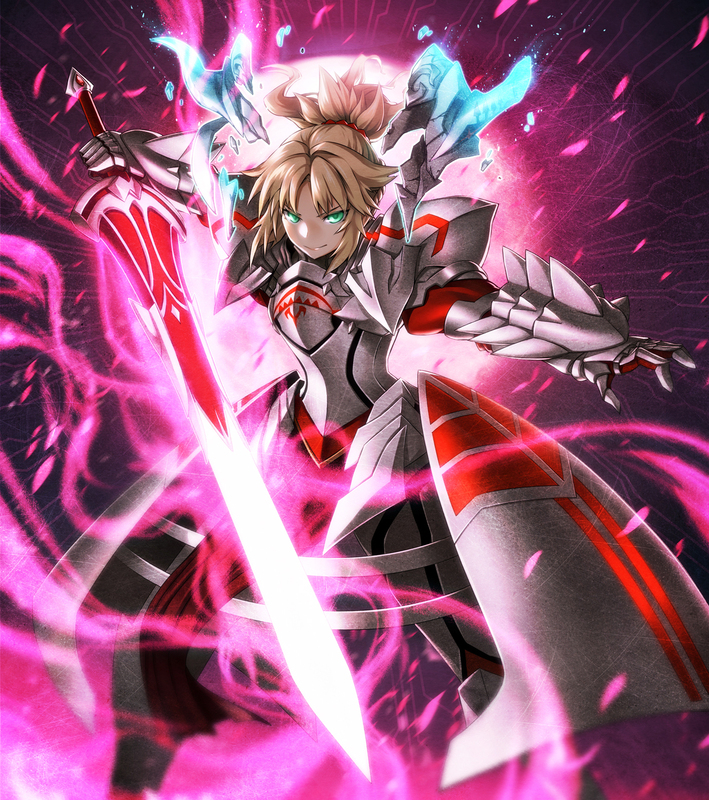 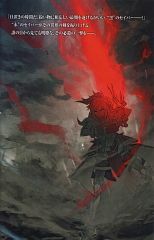 is the Saber-class Servant of Kairi Sisigou as part of the Red Faction in the Turifas Holy Grail War of Fate/Apocrypha. The Servant is a new addition to the project as one of the two replacing Sakata Kintoki and Musashibo Benkei. 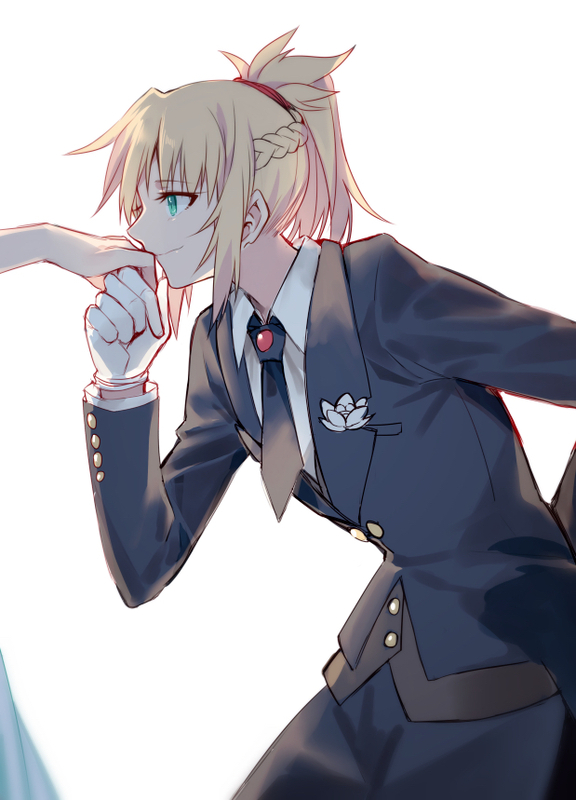 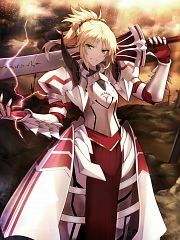 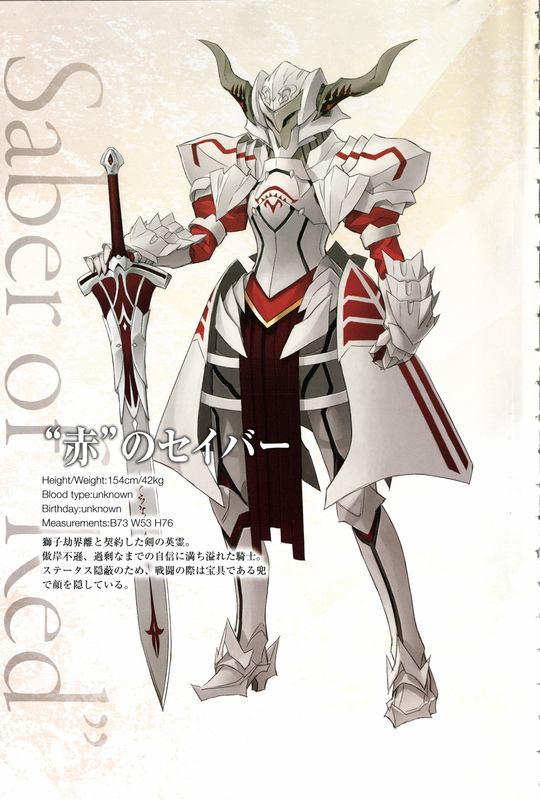 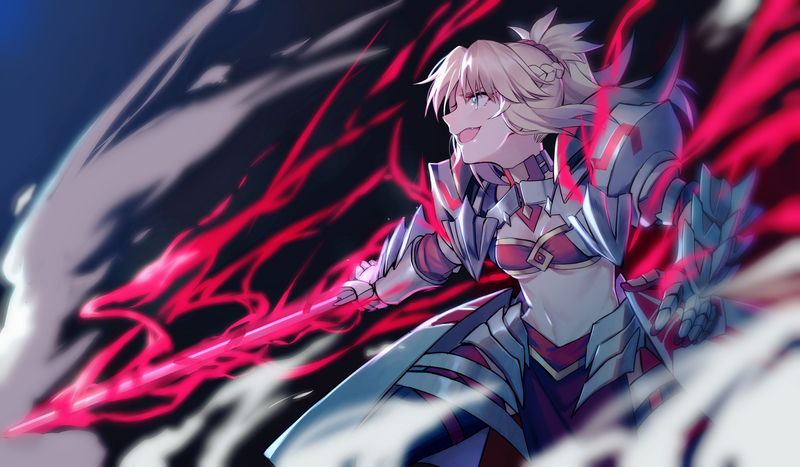 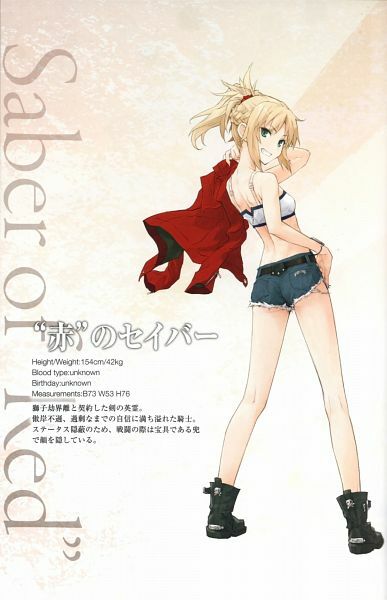 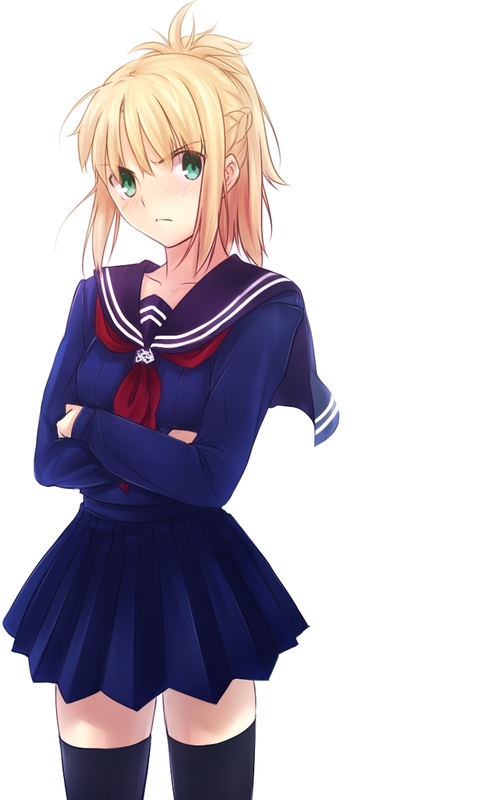 Saber's identity is Mordred, the "son" of King Arthur, but she is actually female despite being raised as the secret male heir to the throne.#1 She was conceived between Altria and her sister, Morgan le Fay, through unorthodox circumstances. 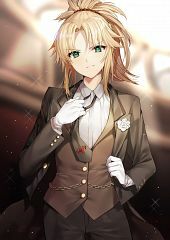 Altria, normally female, was a pseudo-male at the time due to Merlin's magecraft, so Morgan enchanted her with a spell to extract sperm from her. Morgan developed it within her own ovary, and made the child into a homunculus clone of Altria. 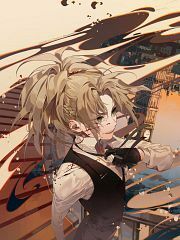 Due to her status as a homunculus, she was given a much faster growth period than a regular human being, and her life span was far shorter. 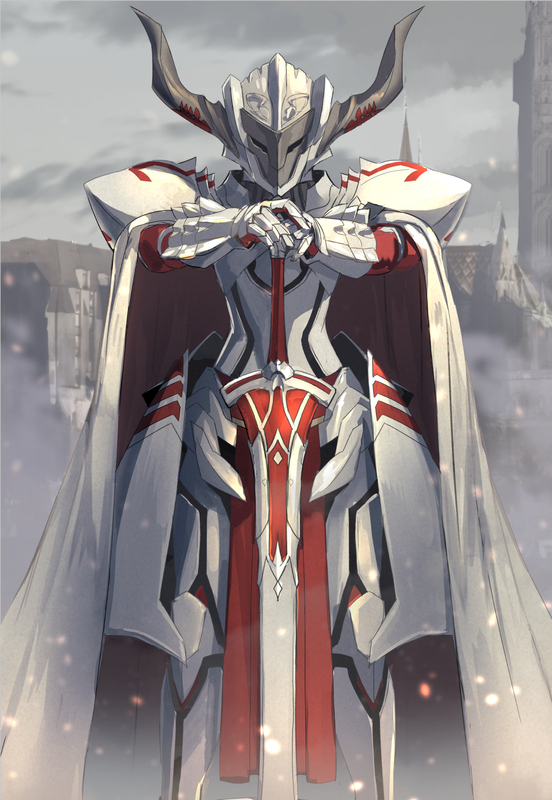 She was raised in secret and told to hide her status and obey the king. 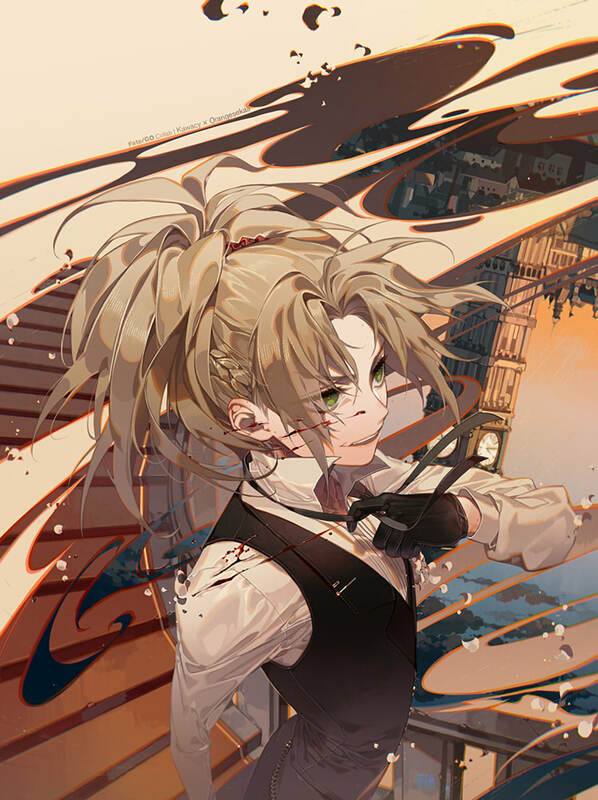 While she has the face of a fair, young girl, that does nothing to hide her brutal nature. She does not bother to conceal it in the first place, so her glaring eyes display a mix of joy for battle and cruelty. While Noble Phantasms are normally a source of pride, hers, crowned with the name of her father, it is closer to a sort of grudge.